Jymie Merritt, bass; Art Blakey, drums. 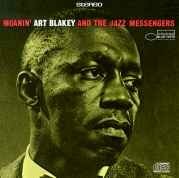 Not for nothing did Art Blakey select the term Messengers to denote his musical and personal purpose at the onset of his bandleading career. Manifestly all meaningful music carries its own built-in message, and to this extent the term could reasonably be applied to any combination of performers. What is more important in Blakey's case is that his message is transmitted not merely in his music but in his words and speeches, his actions and personality. Of the personnel heard on these sides, the horns of Lee Morgan and Benny Golson are too familiar to Blue Note fans to need any introduction, as is Bobby Timmons' piano. There is, however, one newcomer in the house, an artist talented and promising enough to deserve a momentary spotlight. He is bassist Jymie Merritt. The session racks up a self-challenging achievement by starting right out with a climax, for it would be difficult to improve on the groove established by Bobby Timmons' composition "Moanin'." The first chorus is the quintessence of funk, based on the classic call-and-response pattern, with Bobby's simple phrases answered by the horns. Lee's solo opens, fanning out slowly in impact and intensity until by the first release he is swinging in a more complex fashion. Two choruses each by trumpet, tenor and piano are followed by one on bass. "Are You Real?" is the kind of straightforward melody that could as easily have been a pop song designed by one of the better commercial tunesmiths. After Benny's busy but well-organized chorus, Lee takes a solo that reminds one again how impressively this youngster has been developing. Timmons, too, has a chorus that moves smoothly from phrase to phrase, with discreet help from the horns' backing on the release. "Along Came Betty," a wistful theme played by the horns in unison, was inspired not by the personality but, curiously, by the walk of the young lady for whom it was named. If the music reflects her gait accurately Betty walks at a moderate pace with evenly placed, legato steps. Notice in Lee's chorus the wry simplicity of the first few measures in his last eight bars. Benny too, tends to underplay in his solo, while Art's subterranean swells at bars 8 and 16 are the only changes of pattern in an otherwise unbroken and unflaggingly efficient rhythmic support. The second side opens dynamically with Golson's "Drum Thunder Suite," a work in three movements, which was born of a desire on Art's part to play a composition making exclusive and dramatic use of mallets. Since mallets automatically tend to suggest thunder, the title was selected, says Golson, before a note was written. The implications of "Blues March" are clear from the first measure. An attempt is made here (with considerable success) to fuse some of the spirit of the old New Orleans marching bands with the completely modern approach of improvisation as it is felt by the present-day soloists featured here. It is rewarding to study the way in which Art supports the solos by trumpet, tenor and piano with a heavy four-four rhythm that escapes any suggestion of thudding monotony, yet retains the marching mood established by the introduction. Timmons' solo is quite striking in its gradual build from a simple one-note line into an exciting chordal chorus. "Come Rain or Come Shine" is a reminder that Blakey has found the secret of reconciling the hard bop temperament of his band with the melodic character of a typical standard tune. The melody is slightly rephrased through the use of syncopation, the horns introduce it in unison and the soloists take over for a quartet of choruses--Timmons, Golson, Morgan, Merritt--that are no less a reflection of the Messengers' essential qualities than anything else in the set.